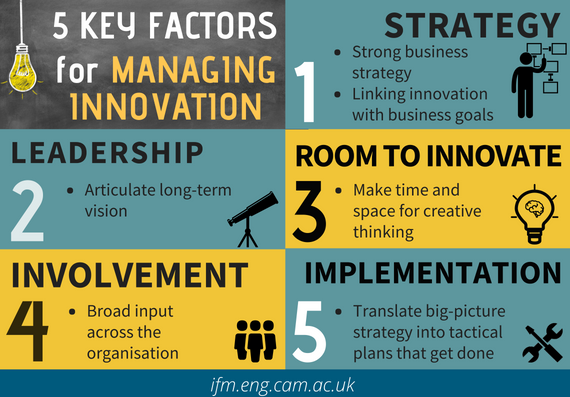 IfM Home > Insights > Technology management > How Does Innovation Happen in Your Organisation? Dr Clemens Chaskel and John Saiz, Industrial Fellows for IfM Education and Consultancy Services, have worked extensively with senior executives at a range of corporations to help them assess and strengthen their corporate innovation and technology management. In this article they draw on their experiences to identify five considerations that are crucial for an effective approach to managing innovation – strategy, leadership, opportunities to innovate, people and implementation – all applicable in SMEs as well as larger businesses. New ideas, new systems, new approaches, new technologies. Innovation is an essential part of continuous improvement for any organisation. But innovation for its own sake is not enough – it must be focused on supporting business goals and generating value. To achieve that, it is vital for an organisation to consider how it manages innovation. With the rapid pace of change in today’s environment, innovation and new technologies not only need to be embraced, but strategies need to be in place for managing them effectively in order to use them to support long-term aims. So how good is your organisation at managing innovation and technology to generate business value? And how could you start to assess and improve your approach? Innovation strategy needs to be closely linked to business strategy. This can be a significant hurdle if the business strategy itself is not well developed. Many companies only really undertake planning and forecasting – thinking about day-to-day requirements and related budgeting – rather than ‘strategy’ as such. They are often driven by latest ideas, typically coming down from a senior (often patriarchal) leadership structure. But they actually need to think much more about their long term vision, or how they need to build the internal capability to deliver that vision successfully within a chosen timeframe. Using an approach like Strategic Roadmapping can be an excellent way for key stakeholders to come together to work out how to exploit company strengths and chart a future direction. A strategy for managing innovation and technology becomes more meaningful and relevant in the context of a well formulated business strategy. Once that business strategy is developed, decisions about innovation and technology can be linked directly to business goals. Strategy development goes hand-in-hand with effective leadership. Part of the responsibility of leaders is to articulate a vision which pulls together people and activities with a sense of shared endeavour. For example, an exercise by NASA to refine its mission statement resulted in it being stated as clearly as possible: ‘Lead Human Space Exploration’. By articulating such a focused mission, leaders were able to set a direction that was clear for all stakeholders. This was then expanded into four priorities: i) Connect to the mission; ii) Enable change; iii) Remove obstacles; and iv) Make programs successful. This laser-sharp emphasis was invaluable as a framework within which all staff could plan and measure their activities. There needs to be room for innovation to happen, and enough space made for creative thinking to be fostered. People need time away from daily fire-fighting. There’s a tendency for organisational culture to be one where everyone is very busy, working long hours, trying to demonstrate how hard they are working in order to protect their jobs. But if they get through more tasks, they just end up with other new tasks on their plate. Consequently, thinking space for creativity and innovation gets squeezed. So time away from the daily routine is vital. Companies need to cultivate an environment where staff can be innovative. For strategy development, it is important to ensure broad involvement of staff who understand different aspects of the business and can provide fresh perspectives. Leadership groups typically don’t involve other staff closely enough in planning. This is unfortunately particularly true for technical experts, despite them representing the technological capability of the firm. When we demonstrate the benefits of involving those employees in the process, by showing senior leaders the insights provided in conversations with those employees, they can start to understand the importance of involving a wider group in the strategy-creation process. The process then becomes better informed to make sound decisions. And when an innovation strategy has been developed, the people within an organisation need to be empowered and equipped with the necessary skills to implement it. So skills and organisational structures also become an important part of the picture. We regularly find that organisations undertake an annual ‘strategy’ exercise and create a strategic roadmap, but then don’t implement the objectives fully or thoughtfully. So they end up repeating the same exercise the next year, and coming to the same conclusions, highlighting the same challenges again. But how do you turn ideas into real concepts that work in the marketplace? A ‘framework for managing ideas’ is needed so that those ideas can be commercialised. A technology management framework can take the form of a toolkit that includes decision-support capabilities for managing innovation. Management toolkits need to be tailored for the organisation, but in its generic form, the basic toolkit includes tools such as strategic roadmapping, quality function deployment (linking grids), and a methodology for managing portfolios of activities. This then extends into a practical process for translating vision and big-picture strategy into objectives and tactical plans. Finally, these five key considerations must be considered as interconnected and simultaneous, rather than happening in order. Each area affects the rest, and each feeds into a continuous process of reviewing and implementing strategy. With a strategy for managing innovation closely tied to business strategy, companies give themselves a better chance of fostering innovation for valuable outcomes. Find out more about Strategic Roadmapping here. For organisations interested in a strategic approach to assessing their innovation and technology management, contact John Saiz at jrs98@cam.ac.uk or Clemens Chaskel at cdc31@cam.ac.uk. For course information and booking, please click here.